You're probably wondering as you ponder your holiday ski vacation plans: where on earth can I ski in a protected national park that is also a UNESCO World Heritage Site – and get a great deal? Okay, maybe that's not at the very top of your list. But you can experience it all within Banff National Park in Alberta, where the Canadian Rockies provide the spine to some of the most scenic, challenging and family-friendly territory on the planet. And oh, the really great part? You have access within the park to three major ski areas: Lake Louise Mountain Resort, Sunshine Village and Mt. Norquay – known collectively as SkiBig3. You can get a tri-area lift pass that allows entry to all of them, so you can sample Canadian Rockies skiing as you wish. 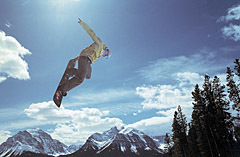 You'll find other deals at the mountain resort websites on SkiCanadianRockies.com and skialbertalive.com. We'll look at each of these areas and consider what combination might work best for you on a ski holiday – whether you're a family, an extreme skier or snowboarder, someone who likes après ski as much as being on the slopes, or all the above. Raw wilderness coupled with easily accessible amenities provides a Rocky Mountain playground. It is covered in dry, fluffy snow that's perfect for skiers and snowboarders. Last year brought record – breaking snow, and this year Mt. Norquay was once again the first ski resort in Canada to open, with Louise and Sunshine close behind. And with high-speed state of the art lifts, you rarely wait in line. Banff National Park, just a 90 – minute drive west of Calgary's international airport, is a protected wilderness area with limited development – recognized by UNESCO as a world treasure. If you're arriving by jet, there are shuttles to the mountain town of Banff. And once there, you have access to museums, galleries, concerts and more, as well as outdoor adventures from snowshoeing to sleigh rides to ice walks to…you name it. Wherever you are in Banff, you can see the mountains, because buildings can't go above three stories. It's common to walk in the tracks of a deer as you go to grab a morning cup of specialty coffee, says SkiBig3 spokesperson Jenna Stuckey. Keep in mind that most hotels provide a shuttle service right to the ski hills. Entertainment, fine dining, restaurants and take-out for every taste, a wide range of accommodations and more than 250 retail shops – many of them with unique local flavor – put everything within your grasp, as well as wilderness skiing. Lake Louise with its 4,200 skiable acres is one of North America's largest mountain resorts. It consistently tops lists as the most scenic. 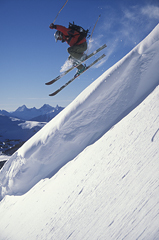 U.S. magazines SKI and Skiing this year noted the resort's remarkable scenery, and extensive and varied terrain. "At Louise, you really feel the seclusion – the lifts here do a good job of getting people up and away," says Paula Worthington of Resorts of the Canadian Rockies. "You feel like you are in the wilderness, but you have all the conveniences and luxuries you need to feel like you are on a world class vacation." The resort has a real alpine feel. The Lodge of the Ten Peaks is a 2,400 sq ft log facility and, new this year, is a 'healthy section' with deli sandwiches and ready made salads. For families, day care is just steps away. Also for families is the Minute Maid Wilderness Centre, a fenced off learning area dedicated to kids with a magic carpet, games, toys and cutouts of Rocky Mountain animals. Another plus for families, or anyone skiing with friends, is that every chairlift has a green run coming down from it, so you can go up together and then people can take varying levels of ability runs down. The ski and snowboard school offers a variety of programs for adults and kids. For the more sophisticated skier, there is the First Tracks program, 8:30 a.m. to 10:30 a.m. You can get on a lift a half hour before it opens to the public and ski or board with a pro instructor for two hours – so you have a private guide show you the mountains for just $99. The back powder bowls offer endless variety of terrain where extreme skiers find endless steep and deep. And everyone can enjoy the terrain park. Enjoy après ski with The Sitz 'n' Suds package, which includes an après ski party with appetizers, a full buffet dinner, and live, interactive entertainment. The fun starts right after skiing and runs through until 8:00 p.m. with bus service back to your Lake Louise and Banff Hotels. This event is held once a week from mid December to the end of March. Temple Lodge is a popular outdoor lunch spot , and it's great on sunny days. Inside, there is a sit down restaurant called Sawyer's Nook – try the organic flat bread pizzas. To ski a secret place, try the Larch area. There is a great run called the Rock Garden – just take a left from the larch chair lift and follow the signs. That area has green and blue and black runs and a great view from the chair. Activities in nearby Lake Louise include snowshoeing, skating, sleigh rides, cross country skiing and the ice sculpture event Ice Magic in January. Just 15 minutes from the town of Banff, you'll find all natural snow with more than 3,300 skiable acres of terrain on three mountains, the only ski-in, ski-out hotel in Banff National Park—the Sunshine Inn—plus 12 lifts and serious snowfall that takes the ski season well into the month of May. Sunshine attracts more than 500,000 skiers and snowboarders every year. And there's that remarkable view. "One of the most magical things about Sunshine is that as far as you can see in every direction there is nothing but pristine untouched wilderness," says veteran Sunshine spokesman Mike Moynihan. "It's inspiring and wonderful." Check out Mad Trappers, an authentic ski log cabin built in 1927 for $300 when people used to ride in on horseback – and then they realized that all this snow would be great for skiing. You can ski all the way down the scenic ski out through the village and then go to the Creekside Bar & Grill at the base for a nice lunch, sit down at the fireplace, and then hop on the gondola and go back and ski. For expert skiers, Delirium Dive in the freeride zone has a well deserved rep for extreme. If you don't have equipment, try Delirium Sundays – a full day, guided program. Delirium is 600 acres of 2,000 vertical feet with a lot of terrain. The guides will show you how to get in to find the safe, best lines – and it includes lunch. "It is an experience of a lifetime and you will have massive bragging rights," says Mike. If you prefer après ski, there are different events going on at the mountain Sunshine Inn throughout the winter. Mad Trappers is open at night and if you want to hang out with locals and lifties, you can go there and play some pool. Hey – don't forget the terrain park, one of the many attractions for families. Of course, there's day care. Mt. Norquay at Banff makes itself known as a great option for families. This is also where you'll find many of the locals, and where World Cup Gold Medal winner Thomas Grandi learned to ski. There is night skiing that includes the terrain park, beginning January. You will also find flexible by – the – hour ticketing. Like the other resorts, there is terrain for all levels. Andre Quenneville, Norquay's general manager, suggests the Cascade quad chair if you're visiting for the first time, then head up to the quad Mystic Express, where you can get a great view of the Bow Valley and Banff. You'll find a wide range of lodgings in Banff and Lake Louise to suit your style – you can get a quote online. Alternatively, the Pension Tannenhof, a Banff Boutique Inn, is one of many options. It's nestled in pine trees within a few minutes' walk to the Banff town centre. This bed and breakfast style inn also functions as an electronic cottage with a laptop available, so it's an opportunity to get away – while being near the heart of the action. I’ve stayed at Brewster’s Mountain Lodge too, and it’s a great downtown choice in the midst of Banff’s fine restaurants and shopping.